The Book of Mormon is a volume of holy scripture comparable to the Bible. It is a record of God’s dealings with the ancient inhabitants of the Americas and contains the fulness of the everlasting gospel. The Prophet Joseph Smith translated this record by the gift and power of God and first published it in March of 1830 as the Book of Mormon. It is now published in many languages as a new and additional witness that Jesus Christ is the Son of the living God and that all who will come unto him and obey the laws and ordinances of his gospel may be saved. 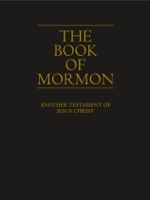 The 2013 edition of the Book of Mormon includes clarifications and adjustments to the introduction, footnotes, and chapter headings; however, these adjustments have not been so extensive as to require members to purchase the new edition to stay current with either the Church curriculum or personal study.